There’s a funny scene in Romancing the Stone when Michael Douglas’ character meets Kathleen Turner’s character and agrees to take her to a phone booth hundreds of miles away. He simply refuses to help her carry her completely impractical luggage and a few scenes later goes even further by chopping the heels off her shoes so she can actually walk in them. This little fiasco encompasses the essence of packing for adventure travel. Less is most definitely more! 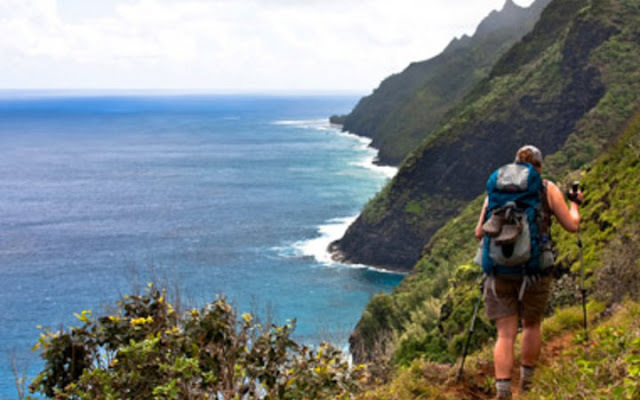 Luggage – If you are going to be doing anything even remotely physical and walking any further than a few hundred meters, then a backpack is definitely the way to go. But not all packs are created equal! Think small and inconspicuous. Dark colours like brown and black will attract less attention than a bright purple or red pack. Make sure it is the type of pack that has a flap on the top that closes over the pack’s opening to keep out water (the types that zip up WILL get your stuff wet). You will also want to put your clothing in waterproof stuff bags – I use standard plastic shopping bags, but there are tougher ones that you can buy from disposals and camping stores. You also want your pack to be as small as possible. Especially if you are only touring (mountaineers may need something bigger). I use a 30 liter pack but would say 45 liters is an absolute maximum for general purpose use. You will be carrying it around a lot and if you cannot fit something in then you probably don’t really need it. Clothing – Think light and breathable! Cotton is always good. Three shirts is usually enough because you can wear one, wash one and have a spare. Take ones with collars to keep the sun off your neck if you are going anywhere remotely sunny. For pants, I like cargoes that can zip off the legs and turn into shorts (which can also double as swimming trunks). Dark colours are always going to hide the dirt and grime so that’s also a good idea. Usually, other than underwear and socks, I don’t take much more than this. Remember that if you need something you can always buy it there and usually for a fraction of the price than at home! Don’t forget to take some type of hat as being sunburnt is a real drag when you are traveling. Shoes – Unless you are doing some serious mountaineering then you probably won’t need those $300 Scarpa trekking boots. In many poorer countries you can buy those $300 Scarpas at the local markets for $10 anyway, because some idiot tourist left them outside his door to dry and an enterprising local stole them to sell at the markets! Think comfort – I usually go for Converse All Stars, but any type of cheap canvas shoe will probably be ok. On a trek across England my Converse shoes allowed my feet to get wet about 10 minutes before my buddy’s feet got wet – he was wearing the $300 Scarpas! Once again, if you need something better, you can probably buy it at your destination for a cheaper price. Other stuff – There are a few things I will never travel without. Sunscreen is the main one because I REALLY hate getting sunburnt. A small multi-tool is often pretty handy too – don’t get a leatherman because you will lose it or get it stolen. You can often buy multi-tools for $5 anyway that work perfectly well. I also always take a lighter ($1 plastic kind) for anything from lighting people’s cigarettes to sealing the ends of ropes. The trick to packing for adventure travel is to pack light, inconspicuous and cheap. This avoids you becoming a human pack-mule or a target for thieves and hustlers. You will also find that you will enjoy your traveling more because you won’t be so tired nor worrying about your gear so much.